New to WordPress? Or are you using a free blog service like WordPress.com, Google Blogger, Typepad or Movable Type, or even LiveJournal? Or are you on another content management service like Joomla and Drupal? Need help starting your own WordPress website? Not have a lot of money, but looking for a good start in the right direction? Great! You have come to the right place! I can help you get started so you don’t have to feel frustrated in starting your own WordPress blog or website. Below are some affordable choices to get you on your way. 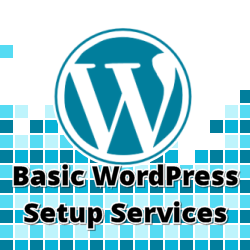 WordPress design service packages start at $350 and business or other types of WordPress sites start at $500. Please use the WordPress Design Services contact form so I may be able to properly access your needs. This is for those who want to have their own WordPress site and have no blog or site to transfer from another service. This package does not include designing a custom theme. This is for anyone converting their site over to WordPress from another blog platform or CMS. This is for websites that have between 1 to 1000 posts, pages, or other post types. This does not include carrying over the design of the previous site, nor does it cover a re-design. This is for those who have a static website in PHP or HTML, and want to convert to WordPress. This is if you are using a blog platform or content management system like Joomla and Drupal and need to convert to WordPress. This is for websites with more than 1001 posts, pages, or other post types. Please fill out the form below. Once your form is received, you will receive an email confirmation from me and an invoice for half of the project’s fee via PayPal. Your invoice must be paid prior to starting the project. The remaining half of the fee will be billed at the completion of the project. If you need web hosting, you can purchase web hosting with me for as little at $40 per year at Host Solutions. What niche is your site?